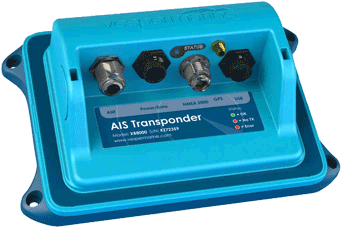 A brief summary of some AIS Class-B Transceivers available as of February 2014. These AIS transceivers are just modules without any sort of display or control interface. They typically have just a few LED indicators for status and a pair of leads to connect an external switch to engage quiet mode, that is, to shut off the transmitter. All units require their own AIS antenna, preferably one tuned to the AIS transmit channel, which is at the extreme high end of the VHF Marine Band. All have their own GPS receiver, but not all include an external antenna (which may be necessary). The listing includes useful hyperlinks to more information about the devices from the manufacturers and resellers. First we look at a group of devices that appears to all be derivative products from OEM assemblies by SRT-Marine Technologies, particularly the SRT Neon II AIS Class-B Transceiver. SRT is a British company that has developed several very highly-integrated and compact circuit board assemblies for AIS reception, decoding, encoding, and transmission. The common feature that identifies these as SRT products is they are all configured with the same software, ProAIS. I have listed them in order of lowest price for best features. 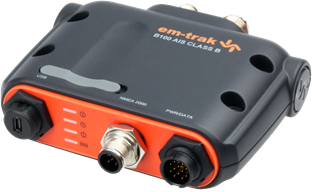 Until early 2014 the em-trak B-100 was unique among the black box transceivers in offering the function to record vessel track to a memory card. The provision of the memory card slot is likely the cause of the lower rating for water resistance. The memory card and slot are also used for programming of the transceiver. By inserting a memory card into the slot with a special file, the particulars of the configuration are passed to the device, such as the MMSI or other vessel-specific configuration parameters. em-trak appear to be an in-house brand of SRT, or at least very closely allied with SRT. The Si-Tex Metadata transceiver appears to be originally manufactured by SRT using their standard modules and packaging. This is based on the use of the ProAIS software for configuration and the mention of features like R-Max. 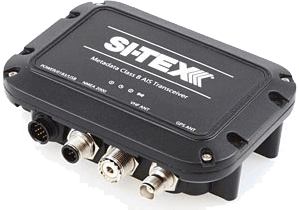 The external appearance of the Si-Tex transceiver is almost identical to the ComNav device, except the position of certain connectors on the enclosure are moved slightly. Since the connectors are likely not mounted directly to a mother board but are on individual leads from the mother board, this variation could be as insignificant as just changing which hole a particular connector is mounted in. The specifications appear very similar, although there may be some difference in the NMEA-0183 serial data port configuration. The Comnav Mariner X2 appears to be another OEM product from SRT. There is great similarity to the Si-Tex Metadata device. Comnav is located in Canada, so perhaps they have obtained the right from SRT to market in Canada. The ProAIS software is used for configuration, and the features include mention of R-Max. Note the slight difference in arrangement of the connectors, which may be only a cosmetic difference from the Si-Tex device. external GPS antenna is required, a $50 additional expense. The Comar CSB-200 appears to be a SRT derivative because is uses the ProAIS software. Since it is made in the U.K., it seems likely it would use the SRT chipset or OEM modules. An external switch can be programmed to initiate quiet mode (no tranmission) or to send an AIS MAYDAY message. The Digital Yacht AIT 2000 seems to be another SRT derivative, as it uses the proAIS application. Digital Yacht does offer a MacOS version of proAIS, which seems to be unique. I do not recall previously seeing a MacOS version of proAIS available. In the USA, AIS transceivers have to be pre-configured by a proper authority, usually the dealer selling the device. The MacOS proAIS application may be useful for obtaining the status of the device and monitoring its operation, following the dealer's setting of the MMSI. 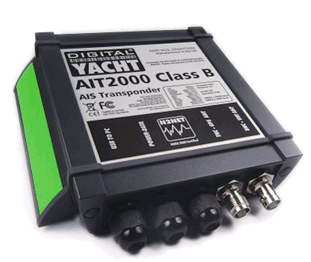 The AIT 2000 also offers the enhanced function of being able to carry data between its NMEA-0183 and NMEA-2000 ports. This function is usually provided only by specialized gateway devices. 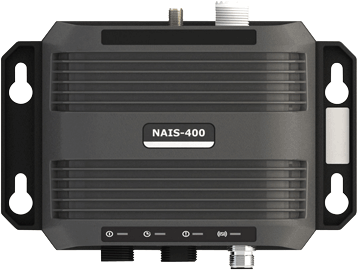 The NAVICO NAIS-400 appears to be another SRT device, but the housing is significantly different than the usual OEM products. The serial port features also seem to be expanded, as has the price. If connecting to NAVICO chart plotters, there is some expectation that the integration will be optimal, and there should be good support from NAIVCO. The external GPS antenna, a NMEA-2000 network cable, and a short USB cable are included in the package; this should be considered when making price comparisons. Below are several other black box Class-B AIS transceivers which appear to not be based on the SRT OEM assemblies, and use their own specialized circuitry and methods developed by the individual manufacturers. 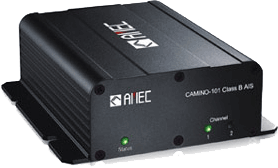 The AMEC Camino-101 is the least expensive AIS Class-B transceiver that I can find, and recently (in November 2013) has been reduced to only $449. It is also the simplest and has the least features. You can add more features to the basic unit, increasing its price as you go. 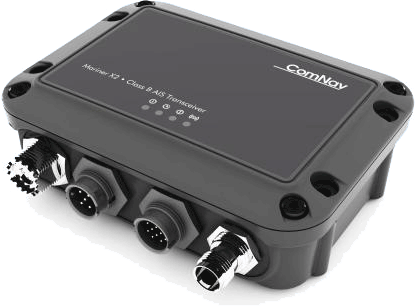 The AMEC Camino 108 is their newest model AIS Class B Transceiver and offers the function to record vessel track to a memory card. The provision of the memory card slot is likely the cause of the lower rating for water resistance. The Camino does not use SRT chips; they have developed their own technology. 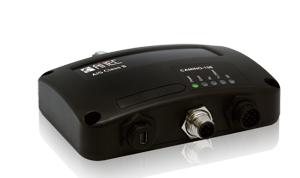 The WiFi version (Camino 108W) can work with iOS and Android devices. The Vesper Marine XP-8000 seems to be the equivalent of the Swiss Army Knife of AIS devices, offering many interfaces, including WiFi. Control and status monitoring using iOS devices is a very attractive feature. The extremely low power consumption is also of interest to long-distance cruisers who need to conserve electrical power. The Vesper device also contains a gateway to transport data between NMEA-0183 and NMEA-2000. The Vesper Marine XP-6000 seems to be the equivalent of the more expensive Vesper XB-8000 but omits the WiFi base station. This article first appeared December 24, 2012.